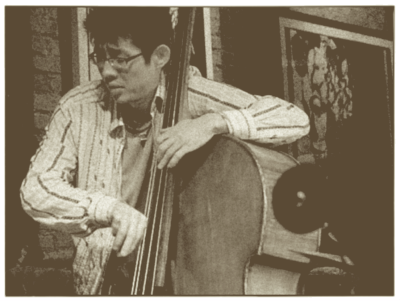 Born in Fukuoka, Japan, Yoshi began to play jazz bass at age of 20. After attending Berklee College of Music in Boston, he joined the National Tour Company of Fosse, a Tony Awarded musical show and traveled around the States before settling in New York City, where he quicky established himself as a sought-after sideman. Yoshi have worked with Artie Shaw Orchestra, Clarence “Gatemouth” Brown, Dan Zanes and Friends, Paquito D’Rivera, John Di Martino, Deborah Harry, Art Hirahara, Randy Johnston, Shunzo Ohno, Richard Stoltzman, Travis Sullivan’s Bjorkestra, Bill Ware, Harry Whitaker and Chihiro Yamanaka, and others. Among the numerous recordings he did, Catch that Train! (Dan Zanes and Friends) won the 49th Annual Grammy Award for Best Musical Album for Children, and After Hours (Chihiro Yamanaka) won the 23rd Japan Gold Disc Award for Jazz Album of the Year. Yoshi also teaches music theory and ensemble at Long Island University. Do you need a headshot or a résumé? © MMII–MMXVIII, by Yoshinori Waki. All Rights Reserved.